Help the wizards from the Wizards' Tower put on a special Christmas celebration for their fellow wizards from the Wizards' Guild in this year's Christmas holiday event. Note: This event was only available from 20 December 2011 until 4 January 2012. While there are some wizards who wish it could be Christmas every day, Sedridor isn’t one of them. He’s been tasked with organising this year’s Wizards’ Christmas Banquet: an annual gathering of RuneScape magic - users usually hosted by the Magic Guild. Not to be outdone, Sedridor and the tower wizards have an ambitious plan to create an extra-dimensional tower dedicated solely to seasonal cheer. It’s been an administrative nightmare, though: the imps, conjured to act as waiters, are missing; animated decorations are running amok; and the eccentric goblin and troll chef duo are taking a scarily explosive approach to Christmas catering. 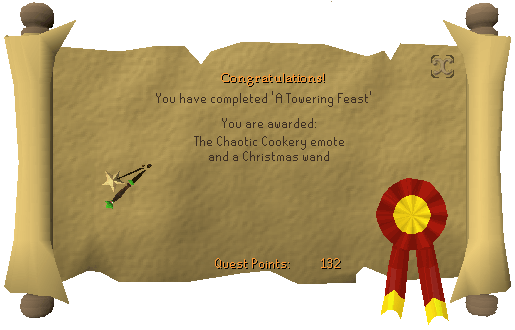 Lend a helping hand to decorate the tower, organise the staff and whip up a feast to challenge even the most rotund of robed bellies. As well as a chance to meet plenty of old friends from the wizarding world, there’s also a new emote to be unlocked, a wand to spread festive goodwill to other players, and a tinsel snake pet for members. You’ll also unlock a minigame, only available over the Christmas period, where you can pit parties of battle-ready snowmen against each-other in stone-cold thaumaturgical throw-downs! 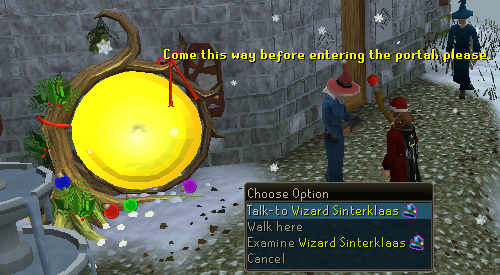 Speak to Wizard Sinterklaas outside the Wizards' Tower. 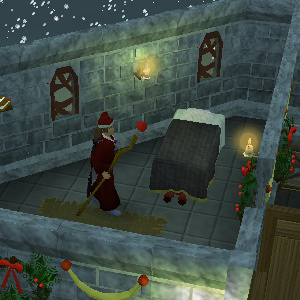 To begin the Christmas event, head to the Wizard's Tower located south of Draynor Village and speak to Wizard Sinterklass. Tell him that you'd like to visit the Christmas banquet, and then head through the nearby yellow portal to be brought to another dimension where the Wizards have created a duplicate tower just for the banquet. Inside the tower, you'll find Wizard Sedridor waiting near the entrance. Speak to him, and he will explain that preparations for the feast are not quite complete. Everything must be perfect so that the "tower wizards" can impress the "guild wizards!" Tell him that you're there to help with the banquet, and he will tell you that several people, including Wizard Isidor, Wizard Grayzag, Kris and Kringle, as well as Wizard Sioncorn all need some assistance. Note: You can help the characters in any order; this guide will go in the order that the characters were mentioned by Wizard Sedridor. 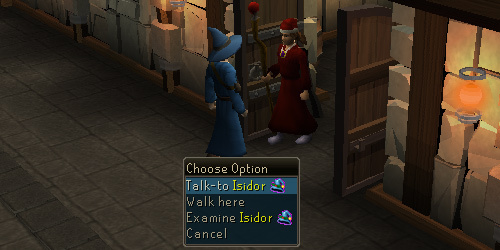 Wizard Isidor can be found in the basement of the tower. Climb down the ladder in the northern end of the tower, and speak to Wizard Isidor who can be found near the entrance to the banquet hall. He wants you to work on the Snow Emitters. Essentially, these gadgets work by taking moisture from the air, and sending it to an arctic plane to freeze. It then sends it back to the snow emitter which blasts it out in the form of snow. 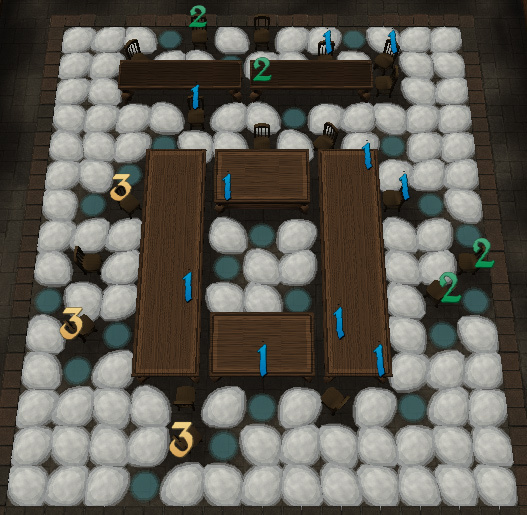 The emitters shoot snow in four directions, and the snow paths they create are blocked by furniture. They cannot be placed where they can fire snow at each other (for example, side by side). You are then enchanted to see "weak spots" in the dining hall, and you'll see numbers covering the area. The numbers indicate how many snow emitters can be placed around the number. It's quite similar to a Minesweeper grid. To remove a snow emitter, simply click on it. Once you've covered the entire floor in snow, Isidor will let you know. Speak to him once more before continuing. Wizard Grayzag can be found on the top floor of the Wizard's Tower. Climb up the ladder to the ground floor, and then head up the staircases to the first and second floors. Grayzag is located in front of the wall in the room with Timmy the Lesser Demon. When you speak to him, he will insist that nothing is wrong. Wizard Mizgog and Grayzag will continue to bicker back and forth, until Grayzag tells you that four of his imps have escaped, and one of them have stolen his hat. Tell him that you'll look for the imps for him. On the first floor, under the gray bed in the southwest corner. On the ground floor, inside the bookcase in the southwest corner. In the fountain just outside the entrance to the tower. In the tree on the south side of the island. 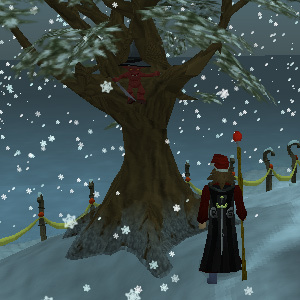 The Imp hiding in the tree is also carrying Grayzag's Hat. Once you "Search" or "Check" for an imp, a short dialog will ensue, and you will then teleport the Imp to Grayzag. 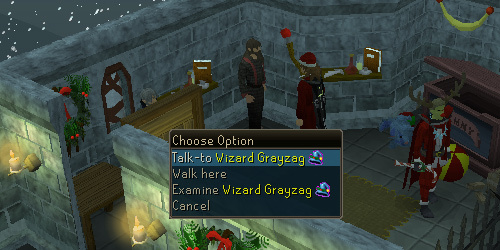 Once you've found all four imps, head back to Wizard Grayzag and speak to him. You suggest using Snow Imps next time, and he insists that it was his plan all along! Head back to the basement, and enter the kitchen located south of the dining hall. Here you will find Kris and Kringle, who are the Troll and Goblin (respectively) chefs. 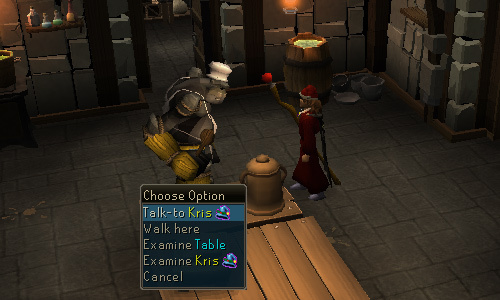 First speak to Kringle, who tells you to talk to Kris. He will explain how to obtain each of the items, and when you ask about "Christmas Spirit," he will give you a Christmas Spirit Jar (empty). 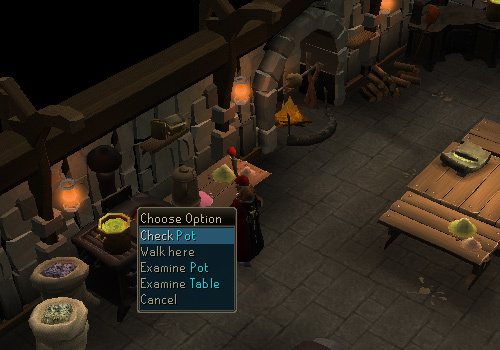 Check the pots in the kitchen. Periodically, you'll notice that a pudding will jump out of a pot and land back inside. 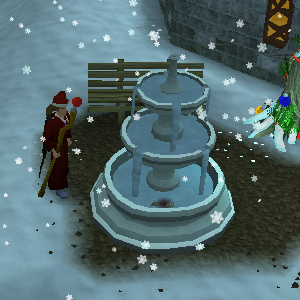 If you "Check" the pot quickly, you'll find an Enchanted Christmas Pudding. Collect five of them! Speak to Wizard Traiborn on the first floor of the tower and ask him if you can have two eyes from his dragon bust, which he refuses. Distract him by telling him that you saw a "thingummywut," which will give you enough time to steak the eyes without him noticing. Talk to Wizard Grayzag and ask him if you can have two of Timmy's claws. He says they're not his claws to give. Talk to timmy, and he will swing at the cage bars, dropping a Lesser Demon Claw. Throwing items from his Toy Chest at him. Snowballs, Toy Dolls, and Christmas Pudding will annoy him, while Bricks and Teddy Bears will please him. Performing certain emotes in front of him. Think, Cheer, Laugh, Jump for Joy, Blow Kiss and Raspberry will annoy him. Bow, Angry, Shrug, Yawn, Jig, Headbang, Cry, Panic and Scared will please him, while all other emotes will be ignored. Use multiple methods of annoying him, as he will simply ignore you for doing the same action repeatedly. 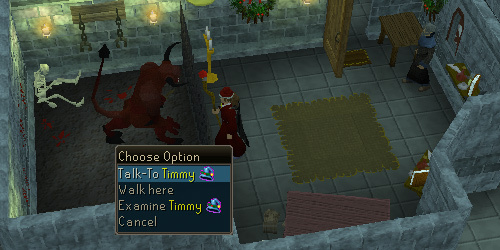 Once Timmy's Anger Level is full, he will attack the cage again, and you will obtain another Lesser Demon Claw. Talk to Wizard Mizgog and ask him about a wand. It just-so-happens that he broke his wand earlier that day, and he gladly gives it to you. 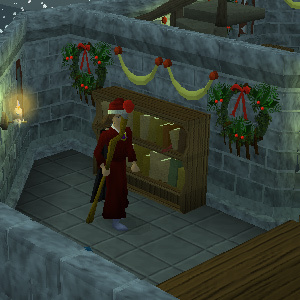 Use your Christmas Spirit Jar on three different players or NPCs. Once you've collected enough Christmas Spirit, the jar will be full! Now that you have all of the required ingredients, bring them back to Kris and use each of the items on him. 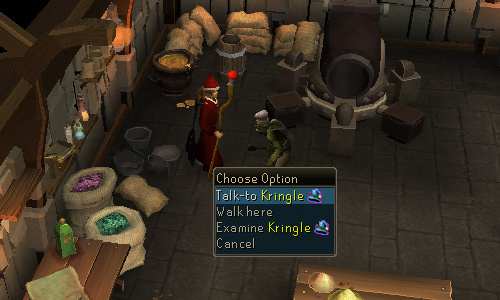 Now talk to Kringle who will give you the ingredients back. He explains that the ingredients must be added to the Secret Dwarven Cooking Device (a.k.a. Cannon) in a specific order. Now tell Kringle that you'll watch him "cook." A cutscene ensues, where he ignites the cannon using the wand, and it begins spinning around, shooting pudding around the room erratically. It knocks both Kris and Kringle over, while you dodge the flying pudding using a Matrix-esque move. Of course, Kringle insists that Goblins can cook just as well as Humans, and you give up trying to argue with him. 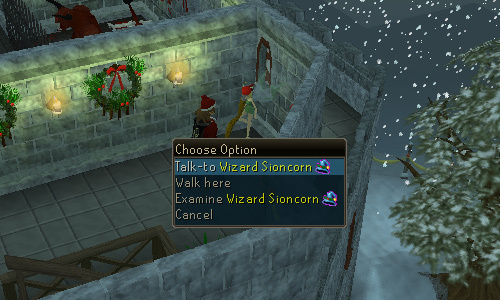 Head back to the second floor of the tower and speak to Wizard Sioncorn. She tells you that she's in charge of setting up the decorations for the feast, but the decorations, which are stored in the hidden attic of the tower, keep escaping. Tell her you'll help, and she will teleport you to the attic. Sioncorn will pick up a box of decorations, and begin walking to the portal in the opposite corner of the attic. Decorations will keep jumping out of the box and wandering around the attic. Your job is to grab them before too many decorations fall onto the floor. If too many (about 5) decorations fall onto the floor and aren't picked up, Sioncorn will give up and leave. Picking up decorations after this will be useless. Simply leave through the portal and try again. 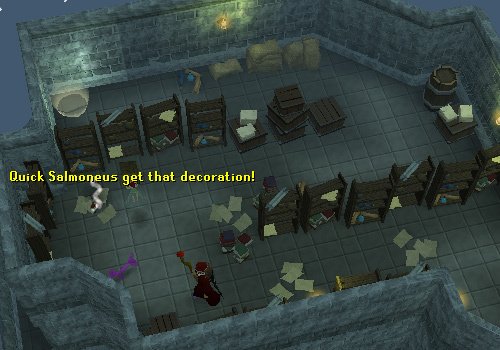 Once you've collected all of the decorations, Sioncorn will thank you. Now head back to Wizard Sedridor on the ground floor, who will offer to bring you to the feast. A cutscene will give you a look at the feast and its attendants. Wizard Grayzag and wizard Frumscone are now bickering, and they will summon Snowman Mages and Snowman Rangers to try and outdo each other. 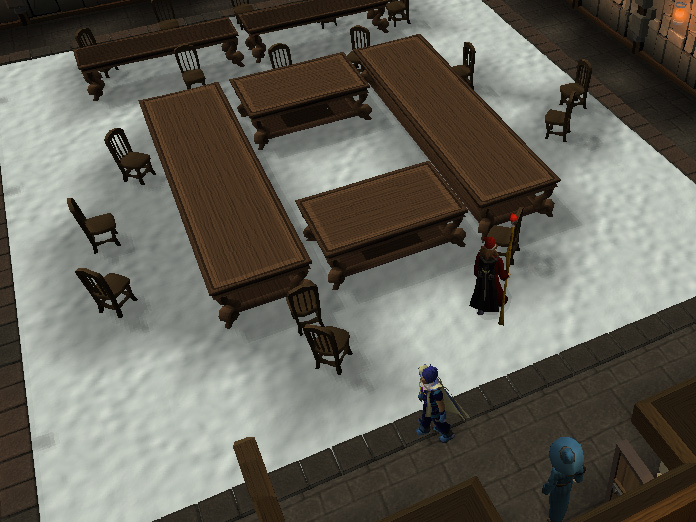 Sedridor will teleport them to an area separate from the feast, where a battle between the snowmen begins. After completing the event, Wizard Sedridor tells you that a tinsel snake has escaped and is roaming around the kitchen. Members have the ability to catch Sparkles the snake and keep him as a pet. Simply head back to the kitchen, and begin searching the pots and bags in the kitchen. Eventually, you'll find Sparkles, who will begin to slither around the kitchen. Catch him to pick him up and make him your new pet!